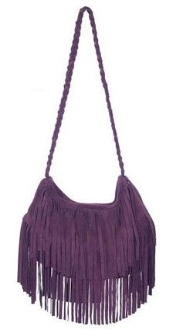 This is the famous & flirty JJ Winters Fringe bag, as seen on Vanessa Hudgens, Jenna Dewan Tatum, Haylie Duff & Paris Hilton. WE HAVE SO MANY BEAUTIFUL JJ WINTERS "READY TO SHIP" COLORS TO CHOOSE FROM!!! OUR PRICE INCLUDES ALL CUSTOM SPECIAL ORDERS! 2 layers of 9 inch long razor cut fringe that sways as the bag moves. 37 inch strap with 22 inch drop. One interior 6 1/2 inch zippered pocket. Want to create your own jj Winters Bag? We can Specical Custom order any jj Winters style of Handbag, Clutch or Belt jj Winters makes in any color of Suede or Leather & hardware that is available! Pleae allow approx 3 or 4 weeks for jj Winters production time.